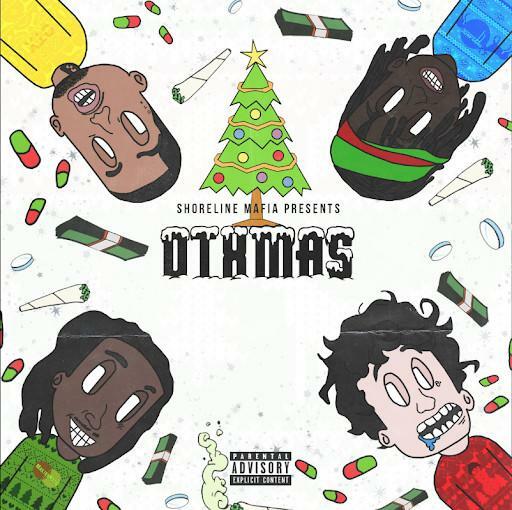 Home>New Mixtapes>Shoreline Mafia Mixtapes> Shoreline Mafia's "OTXmas" Holiday Album Explores The Tradition Of "Molly Water"
Shoreline Mafia Presents: "OTXmas," and all the seasonal tidings they can muster. This might go down as the moment in history where Eggnog first became a hallucinogenic. Shoreline Mafia joins a long list of hip-hoppers to try their hand at a Christmas album, a list headlined by Run DMC, Dipset, Jermaine Dupri, and most recently Jeremih and Chance the Rapper, together as a secular outfit. The cross-section of hip-hop and Christmas is the most profane method from which the boring yuletide rituals are weeded out. You can bet that Ohgeesy, Fenix Flexin, Master Kato, and Rob Vicious saved all the good bits, and swapped the boring ones out in a rigorous manner. The congregation of holy water might be too "Christian" for some, so instead, the Mafia espouses "Molly Water" in its place. With the youngins running the show, Santa's workshop gets a new template, in the form of "Moving Work," the 3rd song on OTXmas. By the time the 8-song mixtape reaches its climax, you'll know where you stand on Xmas mythology once and for all - and by Jove, OhGeesy does a good Bing Crosby. MIXTAPES Shoreline Mafia's "OTXmas" Holiday Album Explores The Tradition Of "Molly Water"